A couple weeks ago, the beloved classic Secret of Mana was remade by Square-Enix, bringing the game to the third dimension by changing its sprite-based graphics by models and textures, adding voice acting to all dialog featured in the game and adding skit scenes for when the party rests at an inn to further flesh the characters out. Naturally, the soundtrack was completely remade for the game as well. However, how do these arrangements fare when compared to their original versions? 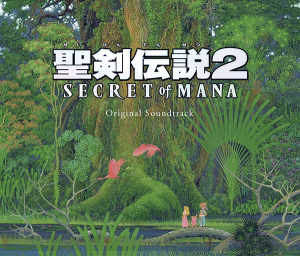 Secret of Mana has always been a beloved classic for RPG players, and its original soundtrack composed by Hiroki Kikuta was as beloved as the game it featured in due to its whimsical melodies, its great capacity to evoke an atmosphere according to the situation it plays in the game, unique sound and interesting musical ideas. Therefore, it was quite a shock to know that this remake would not only have Kikuta himself doing the arrangements, as the music was rearranged by no less than 14 different artists: in addition to Kikuta, we have Noriyuki Kamikura, Youhei Kimura (better known as ARM), Keisuke Kikuchi (known by his alias Kikuo), Yuzo Koshiro, Sasakure.UK, Junichi Sato, Haruka Shimotsuki, Tsuyoshi Sekito, Koji Yamaoka, Daisuke Endo (credited by his alias DE DE MOUSE), Tsutomu Narita, PinocchioP and Sachiko Miyano. Given this, is no surprise that the soundtrack feels quite disjointed and inconsistent when it comes to musicality and sound. First, we’ll start with the arrangement that Sachiko Miyano did of the most recognizable piece of the game: the introduction theme “Fear of the Heavens”. While it starts with a better sampled version of the dragon’s cry, it then proceeds into a short strings section before continuing into the soft piano melody that is characteristic of the piece, accompanied by strings, harp and oboe, but then it slowly blooms into a beautiful orchestral rearrangement upon reaching the climax. Afterwards, the piece slowly comes down until the strings close it off. The slowed down tempo suits the introduction quite well, and the arrangement greatly enhances the coloration and texture the original piece used to have, making it a real treat to the ears. Next, we’ll talk about the arrangements that Hiroki Kikuta himself did, which generally are upgrades to the sound of the original pieces, although he also changed the instrumentation and added extra melody lines to some of them. For example: “Into the Thick of It”, the main overworld theme, features a similar sound to the original excepting for the fact that the flute that plays the main melody was replaced by an accordion, the backing harpsichord was replaced by woodblock percussion and that it was given an additional strings backing in its second loop. While the instrument changes give it something of a heavier folksy atmosphere while still retaining its fantasy feeling, I find the strings backing doesn’t mesh too well with the rest of the piece after a certain point. On the other hand, the new version of “The Little Sprite” is in essence the same exact piece, but with a slightly reduced tempo and featuring an upgrade in the sound due to using samples of a much better quality, making it quite a nice theme to listen, as well as also showing a bit of Popoi’s mischievous character through its playful sound. Next, we have the new version of the main boss theme, “Danger”. In this case, the piece was shifted a semitone down, making it sound a bit more menacing, but it recovers its original tonality when it gets to the heroic second half. Aside of that and featuring better quality samples, it features no significant differences from its original version, although I must admit I have never been much of a fan of its first half due to relying on noise and dissonance to convey a feeling of crisis. We then proceed to the first of the flying themes that are heard when the player is riding on Flammie, the white dragon. This is “Flight into the Unknown”, and its new version features no significant differences aside of lowering a semitone the pizzicato and the xylophone-like accompaniment and adding a couple of guitar and bass phrases near the point where the piece loops, making it a nice upgrade to the original that retains its feeling of flying freely through the world. However, I’m afraid I can’t say the same thing of the remake’s version of “The Oracle”, the battle theme for the Dark Lich. Although it retains its chaotic and disturbing atmosphere, and additionally Kikuta mixed in the Balinese Kekac chant he used as the basis for the piece into this rearrangement, it’s so loud that it drowns the rest of the instrumentation and reduces greatly its creepy factor. And finally, we have the arrangement of the final battle theme “Meridian Dance”. Fortunately, this arrangement retains the fast-paced tempo of the original and improves on its sound by using better quality samples as well as adding a couple extra melody lines. He also added a couple pauses in the transitions between each section of the piece, making it even more exciting and quite suitable for the climax to the game. Next, we have the arrangements that were done jointly by Tsuyoshi Sekito and Koji Yamaoka. The first of their arrangements is for the unsettling theme “In the Dead of the Night” that we can hear after starting a new game. It features the addition of rain and wind sounds over a menacing series of piano bass chords, synth and ends with a creepy choir, making it quite faithful to its original version in showing how terrible the story of the Mana world was with the creation of the Mana Fortress and how that led the world to ruin. Afterwards, we have the theme for the Pandora Ruins “Ceremony”. Starting with an ominous bell tolling, it then proceeds into a creepy melody formed by a duet of gamelans which also adds a synth choir and some bell tolls halfway through. It features no major differences from the original aside of the enhancement in the instrumentation, and it retains perfectly the unsettling sensation it’s supposed to give. They also rearranged all the jingles that are found throughout the game (“You Did It!”, “Join Party”, “I Tried”, “I Tried Even Harder”, “Found” and “Strong”), and I think this is also the first time these same jingles have been given a soundtrack release, as well as the file select and save game screens theme “Door to the World”. They are all pretty much identical to the originals aside of the improvements to the sound due to using better quality instrument samples, so I have no complaints in that front. However, next we have the arrangements I found the weakest in the whole remake, which were done by DE DE MOUSE. From what I have listened, his abilities as an arranger aren’t as well suited to a fantasy-style soundtrack like Secret of Mana is, which results in his work being a poor fit for the game itself and the pieces to lose quality when compared to their original versions. For example, we have the Empire town theme “A Curious Tale”. While the original featured an interesting and somewhat complex interplay between harpsichord, flute, choir and woodwinds, the arrangement opts to replace most of the instrumentation with lead synths and a dubstep-like percussion, and adding bagpipe samples, and while that by itself wouldn’t be bad, I’m afraid to say the arrangement doesn’t follow properly the harmonies and coloration that made the combination of melodies work in the original, resulting in a piece that doesn’t properly come together. A similar problem happens with the arrangement of the standard town theme “The Color of the Summer Sky”. While the piano, pizzicato and xylophone part at the start and the flute-centric part at the end of the loop aren’t very different from the original and have still a nice sound, the main part of the piece features an excess in dubstep-like percussion and a replacement of the main flute for synthesized bagpipes, which are rather grating together and make the piece quite cacophonic to listen. This goes especially for the percussion, which permeates the whole section and makes appreciating the melody more difficulty than it should. And this also occurs in the arrangements for “Distant Thunder” and “Always Together”: focusing on the harmonies instead of the main melodies, messing up the musicality for some of the main transitions in the case of the former, and using too much percussion. However, among his arrangements, the one is disliked the most was the one for “I Won’t Forget”, which was one of my favorite pieces in the original. While it starts off similarly to the original, being an emotional orgel rendition of the main melody to “Fear from the Heavens”, the arrangement instead begins doing an alternation between different instruments and doing volume shifting from a passage to the other, which does a poor work of retaining the emotional and sorrowful component the original version used to have, making it seem more like a comedic theme. Honestly, he should have just stuck to a set of instruments and to a specific volume. Fortunately, the next arranger in the set did a better work with the pieces he was tasked with, as sasakure.UK did minor modifications to some of the instruments and added a few melody lines, with the result being either retaining or enhancing the originals’ atmosphere, although a couple of them are a bit of a mixed bag. As an example, we have “Phantom and a Rose”, which retains the sad and unsettling mood the original piece had despite being a bit more energetic when it climaxes, and while I’d have liked the arrangement to retain the choir from the original, the result is still quite good. A much better example though is the new version of “What the Forest Taught Me”. It uses an enhanced version of the instruments used in the original, but it also adds a few piccolo phrases, and a couple violin lines that greatly enhances the playful and relaxing atmosphere the Upper Land and its four seasons themed forest used to have. Similarly, we have the arrangement for the victory theme “Calm Before the Storm”. It’s pretty much an orchestrated version of it which retains the silences and instrument cues that the original used to have, and it’s really gratifying to hear this reworked victory march after a hard battle against a boss, especially the sound of the tolling bells coupled with the strings and brass. However, not everything can be perfect, as demonstrated by the arrangement of “The Legend”, which is heard in Sage Joch’s cave. While the original featured a heavy emphasis on flute and strings, this version replaces all the instruments with synths and electronica sounds, and while the result is catchy and nice to listen to, I find it doesn’t fit completely with the mystical atmosphere the original gave. And while his arrangement for the Ice Palace theme “A Bell is Tolling” also features an emphasis on electronica, it also retains the crystal-like sounds and musicality that were present in the original, so despite its sound being greatly changed, it still manages to fit quite well with the area. Next, we have Noriyuki Kamikura’s arrangements, who not only retained the originals’ atmosphere and sound in the pieces he worked on, but he also incorporated some additional sections that only serve to enhance the pieces’ own sound. The first of them is for Dyluck’s theme, “Fond Memories”. In this case we have quite a faithful arrangement that retains the same instrumentation as the original, but with an enhanced musicality that makes it even more moving than it was, and it additionally incorporates a beautiful additional section that only serves to enhance the qualities the original piece used to have. On a more aggressive front, we have the new version is for the dungeon theme “Mystic Invasion”, which is itself a rearrangement for the Palace theme “Whisper and Mantra”. This version is a bit more industrial-focused, replacing the drums for metallic clanks, and it also features an additional section borrowed from Seiken Densetsu 3’s “Ancient Dolphin” and which is used as a counter-melody to the main one that really helps in increasing the tension while exploring the dungeons. Similarly, the tension theme “Did You See the Ocean?”, which reutilizes the melody from “Into the Thick of It”, retains the same atmosphere as its original version and helps the players get themselves into the mood for a difficult battle with the addition of an electric organ and electric guitars, and it climaxes into a rearrangement of the main melody from “Fear of the Heavens”. And curiously enough, the instrumentation is also closer to the original “Into the Thick of It” than the arrangement Kikuta himself made for this soundtrack. As for the dangerous area theme “Steel and Snare”, while the original version was rather repetitive and featured an emphasis on the bass and percussion, Kamikura’s version turns it into something of a progressive rock piece that is quite a treat to hear, especially considering how it can be heard in some of the most enemy-infested areas in the game. And for Kamikura’s final rearrangement, we have the second of the ending themes “The Second Truth from the Left”. It’s basically an orchestrated version of the original, but it also adds an electric guitar and an electric organ, and it also inserts a few slow sections and silences between each part of the piece, allowing listeners to appreciate better its melodies and bask in the triumph of having completed the game. For our next arranger, we have Yuzo Koshiro. Honestly, I had high expectations for Koshiro’s work, and while I won’t say he did perfectly, at least the greater part of his arrangements were quite good. First, we have his arrangement for the Gaea’s Navel cave, Matango and Goblin Village theme, “Dancing Animals”. While the original was a repetitive piece that only featured percussion and a bass line, Koshiro decided to build that bass line by changing it into two electric guitar lines and an electric organ, making it into something of a soft rock piece. It’s not bad, but I’m not sure I’d consider a theme as energetic as it as fitting the situations it’s heard in. On the other hand, his arrangement for “A Wish” couldn’t be better. Starting with the sounds of chimes, the arrangement replaces the glass harmonica-like synth and the flute with a piano solo, but it gets added a violin as it gets closer to the end of the first loop, and it repeats half of the piece with an additional string accompaniment before looping back to the beginning, making it a truly emotional piece that fits perfectly the snow-covered Ice Country. Something similar happens with the arrangement for the Lofty Mountains theme “The Wind Never Ceases”. 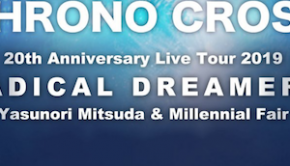 While the original had an emphasis on strings and piano, Koshiro’s take on the piece focuses on an acoustic guitar and flute, and adds bells, resulting in a piece with a mystical atmosphere that also makes one feel as if they were standing on a high mountain and listening to the wind blowing around. The way it starts slow but shifts to a faster tempo when the rest of the instrumentation comes in also represents well the difficulty in climbing these mountains. As for the theme for the Pure Lands, “Still of the Night”, we have something of a large change: while the original used only chimes and a choir to give a desolate feeling, Koshiro’s version adds acoustic guitar riffs, has a solo violin play the lead melody and uses Haruka Shimotsuki’s voice as the backing choir, resulting in a performance filled with emotion that fits quite well the mysterious and beautiful lands where the Mana Tree rests. I also want to mention the arrangement adds a couple extra sections: one in which the violin and choir take precedence, and a piano-focused one right before the loop point. And for Koshiro’s last contribution, we have his take on “One of Them is Hope”, the theme that directly precedes the final battle. This version is a semitone higher than the original, and it changes the instrumentation to be mostly synth-based, while still retaining the tolling bells that announce the finality. However, the track does some tuning sounds near the point where it originally ended to then change into a rock version of itself that features an electric organ and electric guitar that sounds quite like Koshiro’s own work in Castlevania: Portrait of Ruin, which makes it even more exciting and psyches the player for the final battle. 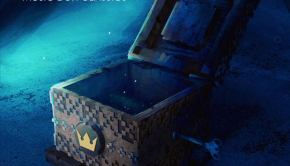 However, it suffers from the problem that it’s a bit long for the scene it plays in, meaning that players generally won’t get to hear the extended section unless they delay advancing through the scene. As for PinocchioP’s sole contribution to the soundtrack, I’ll just say I was not impressed with it. It’s an arrangement for the Dwarven Village theme “It Happened Late One Evening”, which originally was composed by accordion, flute and percussion, but here, all instrumentation was replaced by synths and dubstep-like percussion, with it just having a single violin line and a couple bells at the end of each coda, as well as adding a couple goofy intermissions at the start of each loop. I didn’t really like the original track, but I felt this arrangement also missed somewhat the point. Next, we come across Tsutomu Narita’s contributions to the music for the remake. The first one of them is the Kakkara Desert’s theme, “Secret of the Arid Sands”. The original version was a piece heavy in percussion, that used strings and that focused in a flute-based main melody. Narita replaced the flute synth for a live one, added a bouzouki, a choir and an electric guitar, resulting in a beautiful rendition of the theme that is a real pleasure to listen to, not to mention the way the music builds up to the conclusion right before looping is quite a treat too. I personally think it’s one of the best rearrangements in the soundtrack, and it fits its role as a desert exploration piece perfectly. On that same order, we have the beautiful theme that is used for meeting some of the Mana Spirits, “Eternal Recurrence”. The original featured bells and flute, and had piano and strings as its main instruments, while the rearrangement transforms the piece into a full orchestral rearrangement of itself that is still quite faithful to its original version in tempo and musicality. And next, we have the second of the Flammie flight themes, “The Dark Star”. Aside of the addition of some electronica at a few points, the remade version is completely faithful to the original’s tone of being an ominous march and that also takes advantage of its better instrumentation to enhance its overall feeling. I can say I have no qualms at all about this piece. However, next we have a piece that did undergo a large change when it was remade: the third and final Flammie flight theme “Prophecy”. While in the original we only had a flute, percussions and strings, in the remade version, aside of using better samples for these instruments, we have an extended introduction showcasing better the bass line for the piece as well as showing a bit of the electric guitar and the thunder sounds that were added to the piece. While the first repetition of the main melody shows no major differences from the original, in the second one the electric guitar takes over to play an impacting solo while leaving the rest of the melody in the background, and in the third and final repetition, the bass line changes its progression and the flute only repeats the first half of its part until the end, which combined with the rest of the melody lines and the guitar, it quickly grows into a climax that greatly increases the sense of desperation and hurry the player should be feeling upon seeing the world map at this point: the sky is getting dark, there are lightning bolts flashing every few seconds, and the Mana Fortress is menacingly floating in the skies, meaning they are now in a race against time to save the world before it is destroyed. While I feel the lonesome sound of the original version gave “Prophecy” part of its charm, I find the way the remade version pushes the player to hurry to the final confrontation is quite effective in its in-game situation too. And finally, we have Narita’s version of the Palace theme “Whisper and Mantra”. While at first it seems a very minimalistic arrangement that has only jingle bells and piano, Shimotsuki’s voice doing the chorus enters after a few seconds, and it becomes an improved rendition of the original’s sound that follows its rhythmic and melodic lines to the letter. However, on the second repeat of the melody, strings get added to the mix that gives the piece an even thicker sound, to then finish with a section in which the piano continues replaying its melody, but the strings and choir take on a different, relaxing melody until it loops back to the start. Considering it retains the mystical and relaxing atmosphere of the original, while also emphasizing the holy nature of the Palaces, I don’t see anything I could criticize from it. Next, we come to Junichi Sato’s arrangements. He only took care of the themes “Morning Is Here” and “Now Flightless Wings”. For the former, I find the slowed tempo doesn’t fit very well with the situation for which it plays in the game, as well as the replacement of the driving percussion and flute with electronica sounds and beats reducing its impact. As for the latter, I must question the idea of having reduced the emphasis on the strings in the first half in favor of electronic beats and having changed the second half’s music box samples for the main melody with a flute and having added additional instruments and electronica beats, which greatly reduces its emotional impact and the way it reinforces the bittersweet nature of the ending. Unfortunately, in this case I find “less is more”, as the beautiful music box and flute duet from the original evokes stronger emotions than the mix of flutes, brass and electronica Sato used for the rearrangement. Next, we come to Kikuo, who only arranged “A Curious Happening”, the Scorpion Gang’s theme. Featuring whistling, a saxophone, piano and an electric organ, it doesn’t deviate too much from the original, and I can’t avoid smiling while listening to it due to making me think of the ineffectual bunch of antagonists they turn out to be, despite trying to appear menacing the multiple times they show up. We then proceed to ARM, who only arranged the Sandship and Tasnica theme “Monarch on the Shore”. Although the remake’s version retains its militaristic yet whimsical nature, I have to say that unfortunately, it’s a true cacophony when it comes to sound: featuring a combination of instruments like flute, trumpet, banjo and bouzouki in addition to electronica beats, the problem lies in that the different melody lines rarely come together or harmonize properly, the only time being a point in which the bouzouki plays an Arab-style melody before the piece goes into a chiptune-style repeat of one of its previous sections. And so, we come to our final arranger, who also was the one that interested me the most when I saw the arranger credits: Haruka Shimotsuki, her very participation in this soundtrack being quite a large surprise to me. The first of her two arrangements is for the sad theme “Spirit of the Night”, which replaces the music box with a piano, and as the melody comes in, she adds choruses sung by herself, which greatly strengthen the sadness the piece conveys. And for the climax, she combines these choruses with the piano, flute, and harp, resulting in a combination that is truly a beauty to hear, not to mention tear-jerking. Her second arrangement is for the final piece in the soundtrack: the rest and game over theme “I Closed My Eyes”. Aside of updating the sound to use a real music box, Shimotsuki added a pizzicato accompaniment, chimes and choruses sung by herself, as well as incorporating the extra section taken from “Still of the Night” that was added in the Seiken Densetsu 3 arrangement of this piece, “Long Goodbye”, the result being relaxing enough that it should be able to serve as a lullaby to those who have trouble sleeping. However, I can’t close off this review without also mentioning the two bonus tracks: the first one is an arrangement of “Danger” made by ARM. While I didn’t really like much his take on “Monarch on the Shore” as I explained previously, I found his arrangement of this piece a lot better than Kikuta’s own. 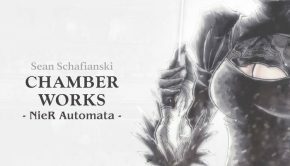 Aside of retaining the original version’s tonality, it also includes a few extra interludes between each section: a descending piano progression, disc scratches; and it also adds Shimotsuki’s choruses to the calm section that is found right after the heroic climax of the piece. And not having enough with that, in the second repeat of the piece, right before transitioning into the heroic section, the sound apparently dies out… and it comes in a vocal version of that section sung by Shimotsuki and accompanied by her own choruses and a harp, in a combination that wouldn’t be out of place in her own fantasy albums or in an EXA_PICO work. Afterwards, the heroic section repeats itself in the same way as the first time, and it loops back to the beginning omitting the calm section. Although I wasn’t really a fan of “Danger” even in its original version, I found this alternate take on it as nice surprise, and I enjoyed it quite a bit. The second one is an arrangement of “The Oracle” made by Kikuo. Unlike the remake version, which starts right away in the Kecak chant, this version first begins with a tolling bell before proceeding with the chant, but it also features a different mix that gives a greater emphasis to the bells and percussion than to the chant itself, as well as featuring several distortion effects and a section with a dark melody a little after the 1:30 point. While I don’t like much the piece in any of its versions, I have to say Kikuo’s version is more enjoyable because the Kecak chant doesn’t overtake the whole piece and allows to listen to the rest of it. So, after having listened multiple times to both this soundtrack and the original SNES renditions of its pieces, I must conclude that majority of the remake artists did quite a remarkable job with the score. Even though a few of the remade pieces paled in comparison to their originals or missed the point Kikuta was trying to make in them, the larger part of the soundtrack is an improvement on these classic melodies, might they be in instrumentation, arrangement quality or merely in atmosphere. Therefore, it comes recommended to those who like the original’s music, and well as to those who enjoy the involved artists’ own works and those who would like to hear alternate takes on these classics of game music. Posted on March 2, 2018 by Gerardo Iuliani. Last modified on March 2, 2018. At first, I hated this soundtrack (being such a fan of the original) but a lot of it has been growing on me. I still would have preferred a more acoustic approach to this music (there’s a lot of synth here) but I imagine the budget just wasn’t there.